We're calling it: Islands In The Stream has become the unofficial anthem of Glastonbury. Kenny Rogers debuted the song in 2013; and Dolly Parton featured it in her record-breaking set a year later. 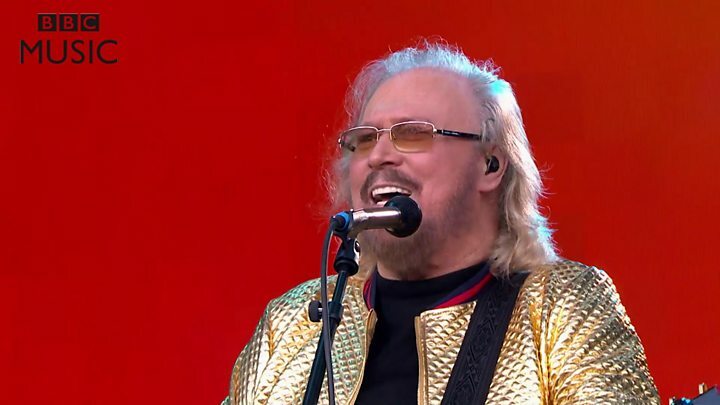 Now Barry Gibb, who wrote the song, has made it the centrepiece of his performance at the festival's coveted "legend slot". It was one of a dozen or more classics from his, and the Bee Gees', catalogue that made it impossible to stand still. There was a sense of euphoria as he ran through the likes of Tragedy, Jive Talkin' and Night Fever, his falsetto never wavering in the bright afternoon sun. As has now become tradition in the legend slot, Glastonbury's security team joined the performance, with a choreographed routine to Stayin' Alive that brought a huge smile to Gibb's face. His triumphant set came a year after Gibb joined Coldplay on the Pyramid Stage for two Bee Gee covers: To Love Somebody and what Chris Martin called "the greatest song of all time", Stayin' Alive. Gibb had been meant to play the festival that year, but pulled out when a family member fell ill. The star recently revealed he struggled with appearing on stage by himself, following the death of his brothers Maurice and Robin. "I don't like being on stage on my own. I miss my brothers. I get nerves being on stage on my own because it is so new to me," he told the Sunday Mirror. "We would all lean on each other. I'd lean on Maurice and Robin and they would lean on me and somehow we'd get through every show. "We knew how each other felt. I knew what their opinions were. We were three brothers and it was a democracy. "We were three brothers who had to agree. If one of them did not like something we did not do it." Gibb beamed a picture of his brothers onto the stage as he performed Nights on Broadway, eliciting a swell of support from the audience. Several were wearing Barry Gibb masks and one fan passed a gold jacket up to the stage, which Gibb gamely wore for the last 15 minutes of his 75-minute set. By that point, the crowd was chanting his name - "Barry! Barry! Barry!" - between songs and the star, who is more than 50 years into his career, was visibly touched by their enthusiasm. "You guys have been the best. Thank you for the experience of a lifetime," he said. "I hope to see you again." Media captionNile Rodgers: 'Lady Gaga gave me those shoes'. Gibb was followed onto the Pyramid stage by fellow disco legends Chic. If anything, they drew a larger crowd than Gibb. 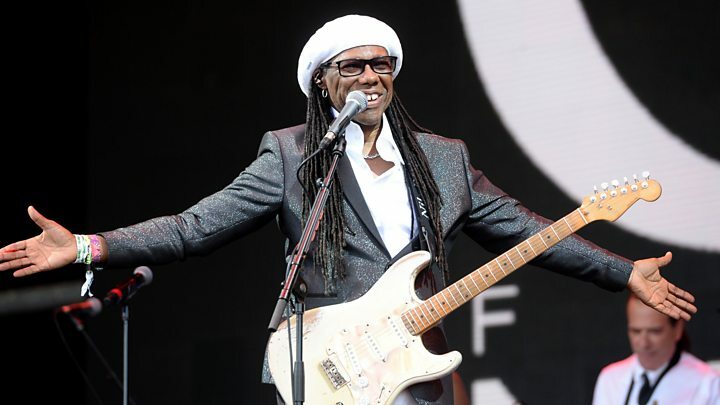 The hills were full to bursting with flag-waving fans as Nile Rodgers served up a feast of funk. The set spanned his entire career as a producer and writer, with Chic's Le Freak joined by Sister Sledge's We Are Family and the Diana Ross classic Upside Down. Rodgers even threw in Daft Punk's Get Lucky (on which he played guitar) and a verse of The Sugar Hill Gang's Rappers' Delight - which sampled Chic's Good Times - for good measure. As one audience member near us noted, "Chic have just won Glastonbury".